Triple chocolate cheesecake is probably one of the most decadent desserts you are going to have this year! Rich, creamy, cheesecake, topped with raspberry mousse; this is a serious chocolate fix, and it looks pretty darn impressive. We don’t usually do too much during Valentines at my house, but a great dessert is a priority for after dinner that night. It’s always so crowded at restaurants, and seems like prices constantly increase just for this night, so because of this, home is where I tend to hang out. This is a very simple Instant Pot cheesecake recipe. The cheesecake is dense, and delicious. We use a 7-Inch Round Non-Stick Springform Pan for the recipe. Now please remember, all 7″ pans are not created equal. If you don’t have the same brand as what I’m using, that’s fine. The important thing is to not overfill your pan so cheesecake overflows during cooking and runs down the side of your pan. First, it’s a mess when that happens, and second, it’s a waste of darn good chocolate. So if you have a different model, just leave about a 1/2″ from the top. We used a chocolate in the 53% – 60% range. Brand doesn’t matter, if you have a favorite use it. For the white chocolate in the mousse, we used Ghirardelli Premium Baking Chips . Again, if you have a favorite, go ahead and use it. The important thing here is to not over melt the white chocolate. When the time comes, just put it in the microwave for 10 second intervals. Stir after each 10 seconds and only go long enough to melt it. For the recipe we used a raspberry puree. Now during the summertime I may switch to a strawberry puree if I can find great strawberries during the season. To make your own puree, just put the raspberries in your food processor and pulse until they are liquid. Depending on the size of your raspberries, it may take a full pint size container of raspberries to get this much puree. If you don’t want clumps strain through a cheesecloth to remove any clumps and there you go. I kept the larger pieces in my mousse. Just depends on what you like. We covered the top of the cheesecake with foil during the cooking process. Loosely cover the cheesecake. If you wrap the foil so tight that nothing gets in, you will need to extend the cooking time. A loose wrap is all you need. If you have excess moisture after cooking, then just dab it with a napkin to remove the excess water. 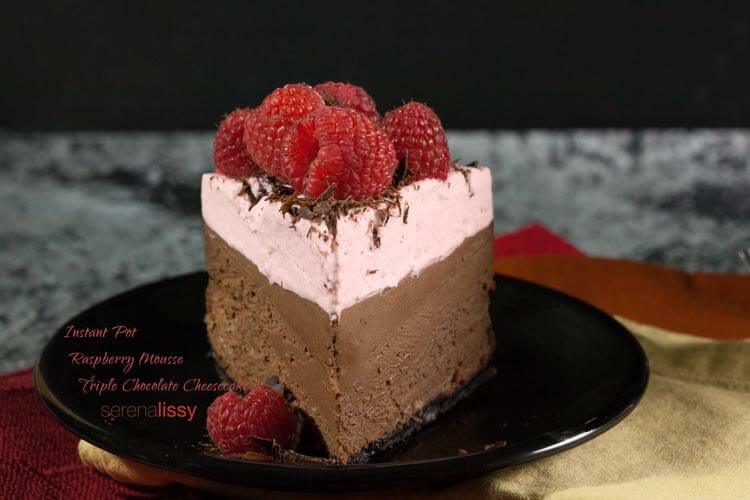 If raspberries just aren’t your thing, we also have a triple chocolate cheesecake instant pot recipe topped with chocolate ganache, or a white chocolate peppermint cheesecake. Please share if you end up making the recipe. Always love hearing how it turns out. Spray the 7" springform pan with cooking spray. Add two cups of water to the instant pot and place the rack on the bottom. Make a tin foil sling to lift the cheesecake in and out of the instant pot. In a food processor combine the whole Oreo cookies and the butter. Pour the crumb butter mixture into the bottom of the pan and pat until even and going up the sides of the pan. Put in freezer for 10 minutes. In a food processor, mix the cream cheese with dark brown and white sugar, and cocoa powder. Once combined, add one egg followed by the 2 egg yolks. Add the melted chocolate and sour cream. Continually scrape the bowl down. Add vanilla and flour and mix until creamy. Pour mixture into the springform pan and smooth with a spatula. Place pan on the tin foil sling and slowly lower into the Instant Pot. Loosely cover cheesecake with a piece of foil to prevent moisture buildup. Set Instant Pot to maximum pressure for 28 minutes. Once done, turn machine off and let it return to normal pressure for 15 minutes. Unlock lid and use sling to transfer pan to cooling rack for an hour. Whip heavy cream to soft peaks and then add sugar. Continue mixing on high until stiff peaks. In another bowl, whip cream cheese until smooth. Add chocolate and raspberry puree. By hand, fold cream cheese mixture into whip cream mixture. Do not overmix. Spread onto the cheesecake and let set in the refrigerator. All images and content are copyright protected. Do not use our images without prior permission. Recipe Source: SerenaLissy.com All images and content are copyright protected. Please do not use our image without prior permission. I absolutely love this recipe, It’s really really good. Everyone LOVE it. One of my favorite. This looks amazing. And it’s actually what I would call a pretty cake. And the raspberries on top are such a great touch. Wow, this looks totally delectable! 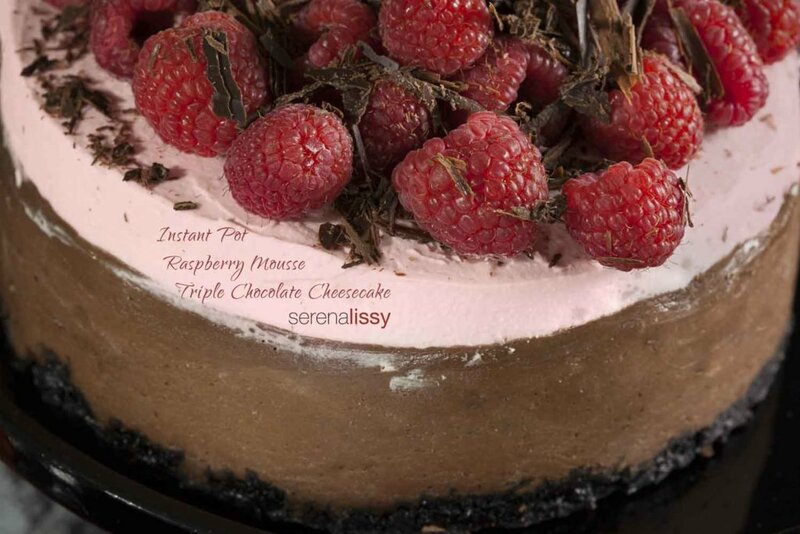 Chocolate and raspberry go so well together, I know this cheesecake tastes amazing. I love this flavor combo. It’s almost sinful! Wow, this was made in an Instant Pot? I really need to get my hands on one. There are so many complicated dishes that can be done in an instant with this appliance. I’m really loving the appliance. It definitely does a lot of things! This is the best-looking thing i’ve seen in a long time! I love cheesecake and now i’m going to have to attempt to make this beauty! I have never had a springform pan. They are super interesting to me. I love that you included the percentage of chocolate you want. I haven’t thought about how different percents would change the flavor! And if you like a darker or lighter chocolate, feel free to change. The percentage isn’t set in stone. Oh my goodness this looks so delicious and it looks amazing! I can’t believe how many things instant pots can make, it’s so popular right now, I’m going to get my hands on one. Saving this recipe! I know what you mean! I’m seeing so many awesome things from the instant pot! We stay in for Valentine’s Day too! I’ve been wanting to try a cheesecake in the Instant Pot and this looks like the perfect one for my first try! Oh my goodness, I just know I am going to be craving this for the rest of the day!! I usually am not a huge chocolate lover, but combine it with two of my favorite things (raspberry and cheesecake), and I’m hooked! Oh wow! This cheesecake is stunning and definitely quite decadent. I just love those layers. I have to make this! I have a couple spring form pans just waiting for me to get unpairs. I love chocolate raspberry! I love cheesecake, this one looks amazing and i had no idea that i could be done in instant pot! Love the idea. I hardly make cakes but your step to step and explanation make it look easy. I should try one of these day, at least for my own birthday cake! I’m a big lover of sweets, and your cheesecake recipe is great! I’m going to make one! Thanks! Now to hear that you made that with an instant pot is incredible. That cake looks so great. Oh my goodness. I love cheesecake. I’m always so surprised how easy it is to make in the instant pot! Mousse always scares me to make, I really don’t know why. Maybe it’s because of house fancy it looks.lol But this recipe seems devine. This one is super simple. Give it a go! Your cheesecake is very mouth watering! I am definitely going to make this on Valentine’s Day. This looks so deliciously creamy and decadent! I would absolutely love this – I’m definitely more of a chocolate girl than vanilla. This looks absolutely amazing! I’m in love with that raspberry mousse. I can’t believe how easy you made it look. 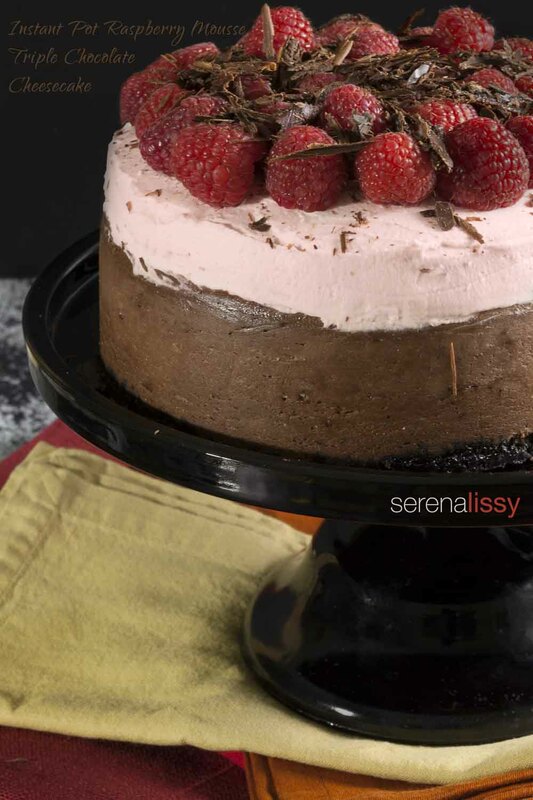 i love mousse anything esp when its paired with raspberry…so decadent. Oh man this looks AMAZING! I love chocolate mousse, but I have never made any myself. I think I totally need to make this very soon! Chocolate and cheesecake, 2 of my favorite things. This looks so good! All my favorite ingredients …chocolate, raspberries and vanilla. Looks like one to put on the to do list. Cheesecake is one of my favourite desserts. This cake looks absolutely delicious and something I would love to make myself at home. I had NO idea you could make a cheesecake in an Instant Pot! That is awesome and the cheesecake looks sooo tasty! Cheesecake is my favorite dessert! I have actually never made my own before, but I just might have to give this recipe a go. Give it a go! Let us know how it turns out for you! Wow, this looks delicious. The layers look beautiful and I love that you haven’t used gelatin in this recipe so it’s suitable for veggies too! You had me at cheesecake! This looks absolutely delicious, I am saving this recipe to give it a go for sure! The cake looks so delicious. I had no idea you could make a cheesecake in an Instant Pot, one more reason to finally buy the instant pot 🙂 I like the presentation, so rich, creamy, and delicious. this looks so delicious and tasty, but also dificult for me to recreate. I will definetely try this type of recipe. This cake looks absolutely fantastic! Such a shame I am to behave this week coz I would have baked it! This reminds me so much of a chocolate cheesecake my mom used to make. It was heavenly. I haven’t made it so long and am feeling so inspired to give this raspberry mousse version a try. The recipe looks awesome. Love your presentation and photography. I’m looking forward to having this with strawberries. Just waiting for them to come into season. This looks awesome! My neighbors would definitely appreciate me bringing this to our Valentine’s Day party Friday evening. This cake looks delicious! Too bad I don’t have an instant pot and I’m not that much of a cook myself to justify buying one. This looks so delicious, I may have to give this a go. I love that it’s so quick and easy. Oh wow… eating this looks like heaven for me, shall I say US. Anything with chocolate is our favorite. How long would i cook them if i used single serve (mini) springform pans? Not certain since this isn’t the size I used. But I would start with 18 minutes and work up from there. Made a dark chocolate cherry version! I did a batch and a half in an 8″ springform (in my 8qt IP), and cooked it 32min (perfect). Used very dark chocolate (85%) cuz that’s what we love, so it’s a very rich cheesecake!! Looking forward to eating it tomorrow! Oh my gosh this sounds delish! I’ve been wanting to try cherry but just haven’t had the time yet. YUM! I used frozen sweet cherries, and doubled the amount of cherry purée since the flavour is milder. It was excellent, and enjoyed by all! Have you ever put the ganache from the triple chocolate cheesecake on top of this? The ganache was amamzing! Wondering if there’s a way to add it to this recipe? Thoughts? Yes, you could easily put that ganache onto this recipe. Yum!